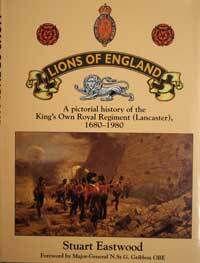 The Pictorial History of the Regiment: Lions of England by S A Eastwood. Pictorial history drawing upon the vast collection of archives and photographs in the King's Own Museum in Lancaster, covering the history of the regiment from 1680 to 1980. Hardbound, over 300 photos. Price including UK postage £26. The King's Own The Story of a Royal Regiment Volume 3 1914-1959 by Colonel Julia Cowper - the best history of the King's Own. On a CD-rom, viewable through a computer with Internet Explorer or similar. Price including UK postage £12.75. The King's Own (Territorial Force) Being a Record of the 1/5th Battalion, The King's Own Royal Lancaster Regiment in the European War 1914-1918. Compiled by Captain Albert Hodgkinson, published 1921. Reprint. Price including UK postage £9.00. The First World War Diaries and Letters of Private William Hodgson, 2nd/5th Battalion, The King's Own (Royal Lancaster Regiment). Account of his training, leave, and overseas service on the Western Front by Private William Hodgson, of Lancaster, who was killed in action on 24th May 1917. Price including UK postage £9.00. The Fourth Battalion, The King's Own (Royal Lancaster Regiment) and The Great War by Lieutenant Colonel W F A Wadham and Captain J Crossley, published Ulverston, 1935. This book has now been reprinted by the Museum and is available for £9.00 including UK postage. Bantams at War - The Story of the 11th (Service) Battalion, The King's Own. By Major Carter of the Battalion. Price including UK postage £2.50. King's Own - Macedonian Front in World War One - A brief record of the 2nd and 9th Battalions in the Salonika Campaign 1915-1919. Price including UK postage £2.50. 9th Battalion in Macedonia (March 1918 to October 1918) from the War Diary of Captain Cumberland. An interesting account of the last months of the war in Macedonia, including the final battle of Doiran in September 1918. Price including UK postage £4.90. Trench Orders - Facsimile reprint of Trench Orders for the 55th (West Lancashire) Division January 1918. All you ever need to know about Trench Warfare. Price including UK postage £2.50. Ballads of the King's Own by Ellis Williams. A collection of regimental poems, first published in 1919, including 'The Message' to the memory of Private James Miller VC. Price including UK postage £2.50. 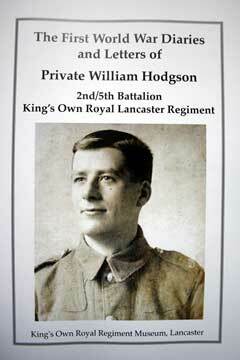 The Victoria Cross and the King's Own Royal Regiment. This publication describes the Victoria Cross and gives brief details of all those members of the Regiment who received the award. Price including UK postage £2.50. The History and Traditions of the King's Own Royal Border Regiment. A Short Guide. All you need to know about the Regiment and its history. Price including UK postage £1.50. Regimental and Army Numbers - A guide relating to the King's Own with explanation of the numbering systems. Price including UK postage £1.50. Actions, Movements and Quarters - King's Own 1680 to 1959 and King's Own Royal Border Regiment 1959 to 2005. 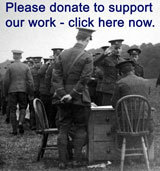 Comprehensive list of the locations of the Regiment, including details of actions, including both World Wars. Price including UK postage £2.50.